Oh how good it looks. Pontius the Knight, Amadeus the Wizard and Zoya the Thief are back! Trine 3: The Artifacts of Power is a big new entry in the Trine series from Frozenbyte, bringing back all the puzzle solving co-op action we love, complete with some amazing new visuals. If you missed the other games, think of the Trine series as a modern version of The Lost Vikings. Three characters head out on the adventure, each with their own attacks, playing style and special abilities. In order to progress through the stages and defeat the enemies, you have to use their skills in concert by switching between characters. It's a swell set-up for a solo player, but when you throw in co-op for up to three people (online, local, or any combination of the two), you've got the makings of an amazing cooperative experience. 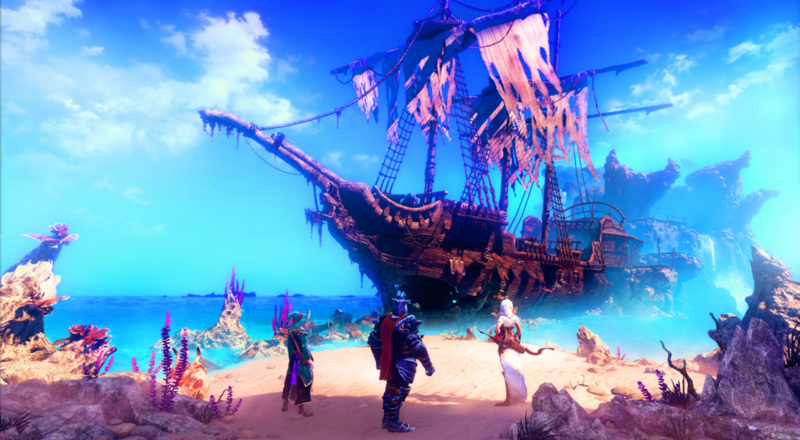 Trine 3 does things a little different than the first two games. There's still plenty of arrow shooting and block summoning to get past obstacles, only now, it's all in 3D. Not the gimmicky 3D with red and blue color separation. This is the kind of 3D that fleshes out depths of a world without needlessly complicating gameplay. Trine works well on a flat plane, but Frozenbyte decided it needed a little extra oomph. The new structure moves and turns the world on a set path, making puzzles much more intricate than before. It still looks phenomenal, only now, it's 3D phenomenal. Page created in 0.3710 seconds.